Nick Schultz | The Phoenix Loyola head coach Porter Moser meets the media after sealing another MVC title. 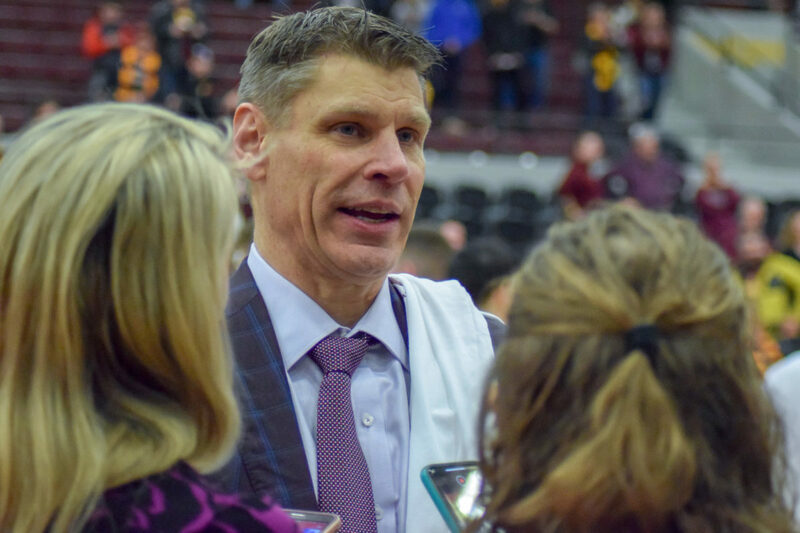 Loyola men’s basketball head coach Porter Moser will be moving from the sideline to the TV studio this weekend. Moser is set to join Turner Sports and CBS Sports’ coverage of March Madness as a guest analyst March 23-24, according to a press release. He’ll be in studio in Atlanta with former WNBA player Candace Parker, CBS Sports reporter Seth Davis, former NBA player Brendan Haywood and host Casey Stern for the second round of the NCAA Tournament. In an interview on the “Mully and Haugh” show on WSCR-AM 670 “The Score” March 21, Moser made it clear he was interested in doing TV work during the tournament but didn’t know if he’d end up in studio or not. Last year, Moser led Loyola to its first Final Four appearance since 1963. This season, the Ramblers secured their second straight Missouri Valley Conference regular-season title before falling to Bradley University in the quarterfinals of the conference tournament — which took took them out of contention for March Madness. Loyola’s season came to an end March 19 with a 70-61 loss to Creighton University in the first round of the National Invitation Tournament.